Easter 2017 at Croyde Bay Holiday Resort! Available this Easter for only £99 per night! Offering an indoor pool and a spa and wellness centre, Croyde Bay Resort is located in Croyde. Free WiFi access is available. Each room here will provide you with a TV, tea and coffee making facilities and some rooms also have a fridge. Featuring a shower, private bathrooms also come with a hairdryer and free toiletries. Sea view or garden views are available in the room. Extras include a desk, bed linen and ironing facilities. At Croyde Bay Resort you will find a restaurant, a tennis court and a fitness centre. Other facilities offered at the property include entertainment staff, an on-site surf shop and lessons, and meeting facilities. An array of activities can be enjoyed on site or in the surroundings, including bowling and mini golf. Begin this wonderful holiday with 3 nights in New York, where you’ll have plenty of time to explore Manhattan, catch a Broadway show, see the Statue of Liberty and shop-til-you-drop. Then set sail on an iconic journey from New York to Southampton on board the newly remastered Queen Mary 2. And remember, all of these benefits are available for all eligible family members too! So how do you find out about these offers? Or visit your local Vauxhall Retailer to test drive the model of your choice. 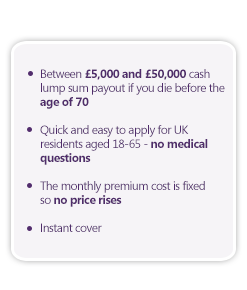 UNISON Life Cover pays out a cash lump sum if you dieduring the policy term OR pays you cash back if you keep the policy to age 70 and you don't claim. So either way, there's a cash payout. Plus, your premiums are fixed, so you don't have to worry about price rises! * Cash back if you keep the policy to age 70 and you don't claim. Terms and conditions apply. The amount of no-claim cashback depends on your age when your policy starts. Guaranteed acceptance for UK residents aged 18-65. Please see Policy Wording for full details. For the first 24 months benefits are payable for accidental death only; for death from natural causes in that period, a full refund of premium will be paid. Have you ever considered what would happen if you were seriously injured in an accident? If you were left permanently injured would you have enough money to look after yourself and your family, adapt your home and maintain your standard of living? 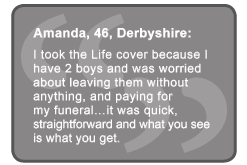 And if you died in an accident, would those you care for be able to cope financially? 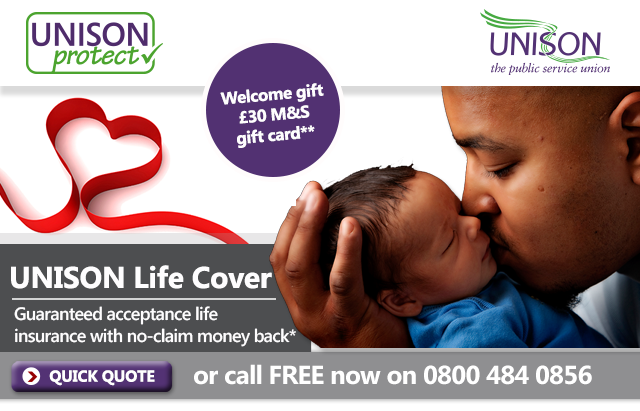 As a UNISON member you have the chance to apply for £100,000 cover with no fuss - no need to answer any medical or health questions. The plan pays out £100,000 for accidental death and £10,000 to £100,000 for listed permanent injuries. This cover costs just £8.75 per month - that's just over £2 per week - and it could make all the difference to you and your loved ones.